After my last post, I started thinking about other places around the ranch that we repurpose things. This morning as I did chores, I snapped some photos of a few more. Almost every part of the fence in this photo is repurposed. The pipe used to construct the fence on the left was used in the oil fields. The fence on the right is guardrail, the same as you see along the highway. The tall poles spent the first 60 years of their career holding up power lines. And of course, the railroad ties holding up the fence I've already explained in my last post. The sheets of galvanized steel used to construct this windbreak came off an old building that was torn down. The poles that support it are old power line poles also. The windbreak serves to protect the cattle from the sub-zero windchills that we often see in winter. Another use for old tires – salt feeders. Cattle, unlike humans, seem to regulate their salt intake quite well. In fact, their diet of grass or hay is often short on salt, so we offer it free-choice in these tire feeders. This tire in particular probably came off the front of a tractor and was turned inside-out, which is why it looks so funny. We probably have 20 or 30 of these feeders scattered throughout the ranch. In addition to tires, we also have made salt feeders out of a bathtub and a urinal – but they aren't in the yard, so no photos today. 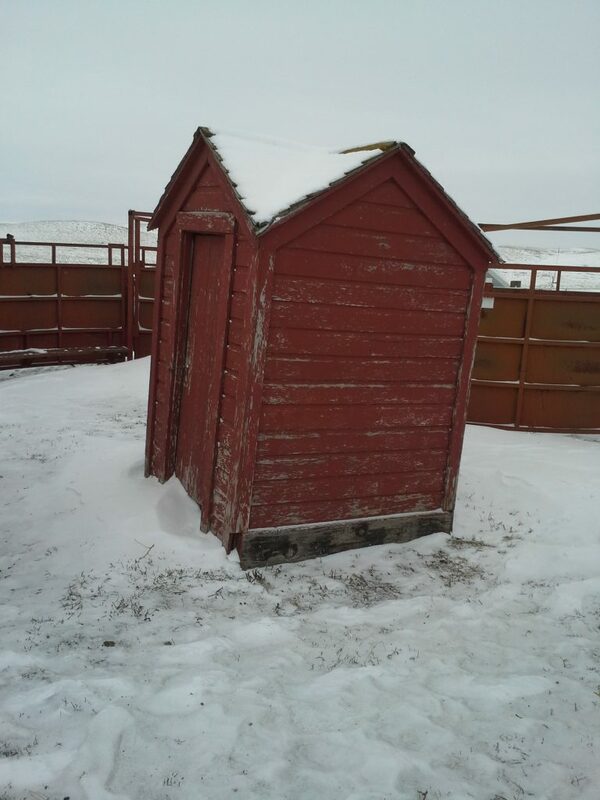 Speaking of urinals, this old outhouse serves as a storage shed for some cattle-working tools, such as sorting sticks and branding irons. Don't worry, this isn't the original site – there's no hole in the floor. One is obvious – the buckets. This is probably the most coveted of repurposed items a farmer or rancher can obtain. It almost seems like a crime to see one in the ditch and not stop to pick it up. Here we're using them to deliver grain to the calves, but they are also used for a hundred other jobs as well – cleaning out water tanks, carrying fence clips, a place to sit, hauling water to random animals in the barnyard…I could go on and on. The second repurposed item here is what we put in these buckets. Dried distillers grain is a by-product of ethanol, so I think that qualifies. About 25% of the grain in the pile is distillers grain. Every farm or ranch has at least one coffee can full of rusty, bent, used nails waiting to be straightened and pounded into the next building or repair project, which will probably involve salvaged lumber from the last generation's building project. You see, repurposing isn't a new idea for those of us who work close to nature. Perhaps it is because we have observed nature enough to see that she doesn't waste anything either. Got to love South Dakota winters! Yes, that is a minus sign in front of the 18.